Which home improvement giant makes the better long-term investment for income seekers? Lowe's (NYSE:LOW) and Home Depot (NYSE:HD) are two of the largest retailers in the stock market, with $150 billion of annual sales between them. Income investors face a tough decision when choosing between the home improvement giants, though. While they each pay the same annual yield, Home Depot's earnings are growing at a faster pace. On the other hand, Lowe's has a better track record of dividend hikes. Below I'll stack the two companies against each other to see which makes the better dividend stock buy today. Lowe's and Home Depot each yield roughly 2%, which is the average for the broader stock market right now. In other words, you'd be getting just as strong of a payout if you bought a widely diversified index fund like the Vanguard Total Stock Market ETF (NYSEMKT:VTI). Sure, you give up the potential for market-beating price appreciation and dividend growth in that scenario. However, you're also protected from volatility in the other direction from dividend cuts or sharp stock price slumps. 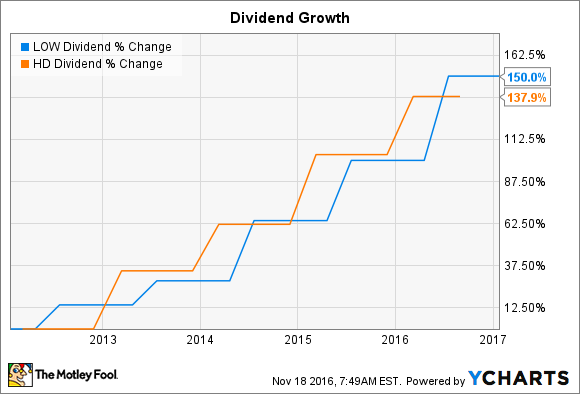 Lowe's has its larger rival beat in the metric of dividend payment history. The retailer has raised its payout every year since it went public in 1961. The 55-year streak is one of the longest in the market, and it easily qualifies Lowe's as a Dividend Aristocrat. The history is even more impressive when you consider how cyclical the home improvement market can be. Home Depot, for example, was forced to pause dividend hikes during the worst of the financial crisis. Lowe's pays a less generous dividend in terms of earnings. Because it is still expanding its store base, the retailer aims to send out just 35% of profits to shareholders, compared to Home Depot's 50% pledge. These differing approaches haven't produced much daylight between the two retailers in terms of pure dividend growth, though. Both companies have raised their dividends by over 20% in each of the last two fiscal years as their payouts have more than doubled since 2011. LOW Dividend data by YCharts. Each company's capital allocation strategy includes a major commitment to share buybacks. Home Depot and Lowe's have both reduced their outstanding share count by about 40% over the last decade. One important consequence of that strategy is that a larger portion of profits are accumulating to shareholders who simply hold on to their stock. Another is that dividend raises become cheaper to implement on a per-share basis, since there are far fewer shares in circulation now than in the past. Those favorable trends point to solid dividend growth for both companies, but Home Depot has the edge when it comes to its long-term outlook. Rather than expanding its store base, the company has decided to aim for substantial sales gains through pushing deeper into markets like the professional contractor segment and the maintenance repair and operations industry. Meanwhile, its comprehensive bet on e-commerce has protected its market share from online-only competition -- setting it apart from most national retailing chains. Finally, thanks to Home Depot's incredible financial efficiency, shareholders can expect market-beating earnings and dividend growth from here. Operating margin has doubled over the last decade to far outpace Lowe's improvement. Return on invested capital, which both management teams have identified as critical to their business, is another area where Home Depot simply trounces its smaller rival. Given that both stocks are valued at a similar earnings multiple of 22 times earnings, I'd buy Home Depot over Lowe's with an eye toward future market share gains and continued profitability improvements through at least 2018.